Cup of Plum Deluxe Delightful Morning Tea. 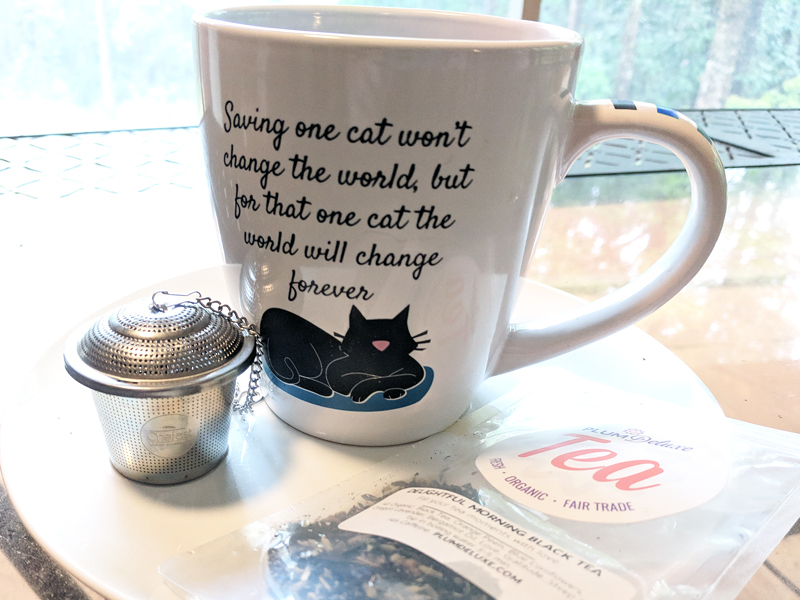 My grandmother gave me the “Save one cat, save the world” mug. I don’t know where she got it, but isn’t it adorable? Ok. Time to surrender my southern card. Hot tea (not sweet iced tea) is one of my favorite beverages. Friends and family frequently present me with quippy mugs on gift-giving occasions. For our 5th anniversary, David and I renounced the traditional wood gifts and opted for a beautiful cast iron Aztec-designed Japanese teapot. We also keep selections of our favorite blends on hand for guests to try. I even share novel-tea (see what I did there?) with my friends at Christmas. 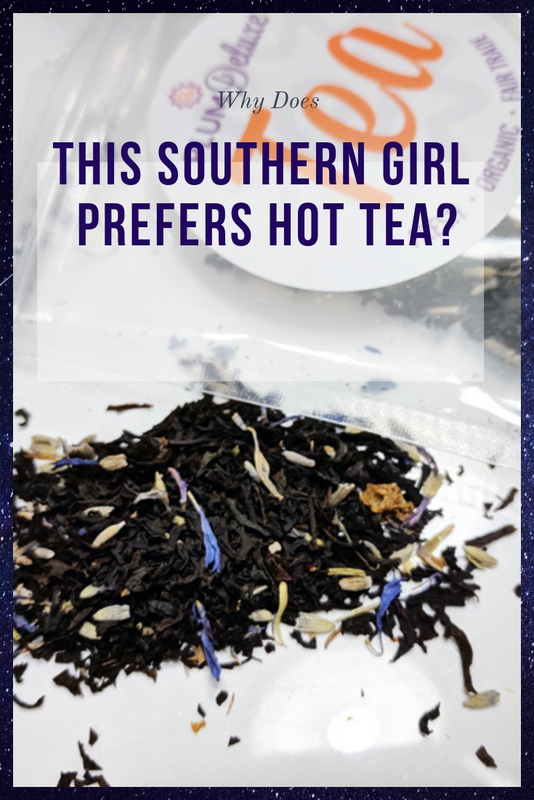 So how did a southern girl who grew up in the heart of sweet-tea-swilling Dixie develop a love of the hot brew? Sentiment. Drinking hot tea takes me back to earlier days when my grandmother and I would steep a pot and sit on her screened-in porch, listening to the wild bird calls. We ate homemade blueberry jam and toast. One year, I painted a ceramic teapot for her. It became a tradition. While I love my coffee as much as the next person, when I need a taste of comfort, I reach for hot tea. I sip and savor, relinquishing thought to experience the moment. For that, I need a tea that doesn’t distract. I don’t want the pleasure broken by bitter aftertaste, or worry about the process by which the leaves reached my cup. I just want to savor and let the world lapse into a peaceful existence. This week, I savored my thoughts over a couple of cups from Plum Deluxe. I eagerly accepted their offer to sample a selection of their teas. Why Plum Deluxe? Well, their business goals completely line up with what I value in a cup of tea, so I couldn’t wait to try it. Plum Deluxe specializes in “Making Moments Matter” and they believe you are the expert in what matters to you. They endorse positivity in everything they do. Fresh, Organic, and Fair Trade: I don’t enjoy fretting over where my tea came from. Was it raised in environmentally harmful pesticides? 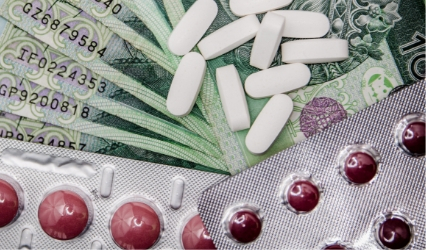 Are the workers treated fairly? I know that Plum Deluxe meets these stringent requirements. I received 3 different 1 oz samples – Sweet Spot Black Tea (think Butterscotch tea – YUM! ), Delightful Morning (Lavender Earl Grey), and Porch Sippin’ Pecan Black Tea. 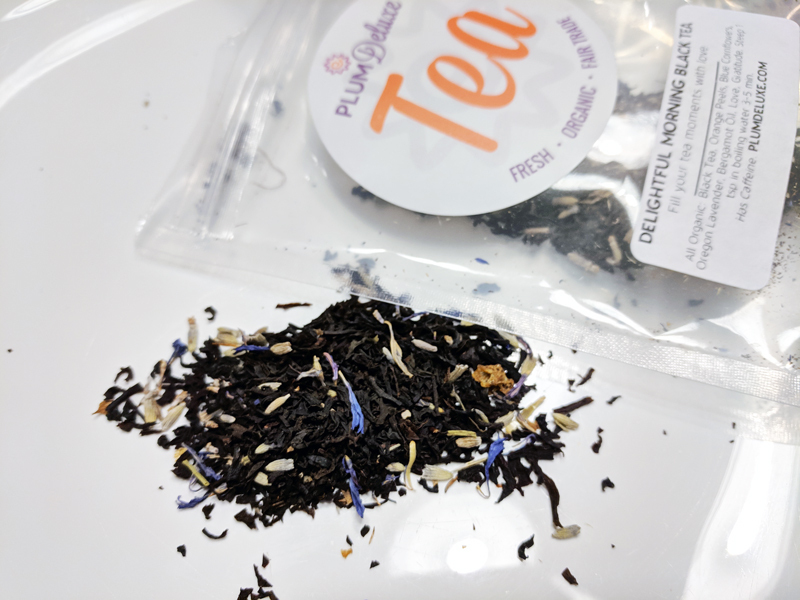 Plum Deluxe also sent a single-serve sample of Peaches N Cream Oolong (Peach and Vanilla). I’ve tried and enjoyed all of them, but the Delightful Morning was my favorite. I originally ordered Delightful Morning for David since he’s an Earl Grey fan and this tea contains bergamot (the flavor behind Earl Grey). Typically, I don’t care for Earl Grey, so the fact this one came out on top genuinely surprised me! He wants me to order their Mindful Morning for him to test out, which is Earl Grey but doesn’t have the lavender. Plum Deluxe Delightful Morning – Can’t you almost taste the pretty! It’s a feast for the senses. Dotted with beautiful blue cornflowers and large cut black leaves, I think it’s one of the prettiest teas I’ve seen. The sweet, uplifting aroma wafted from the package begging me to taste. And, the taste is slightly sweet and full. Unlike most earl greys, this one is balanced without a bitter astringency. Hints of vanilla harmonize with a lavender undertone. The package invites me to fill my moments with love. And the ingredients include organic black tea, orange peels, blue cornflowers, Bergamot oil, lavender, and vanilla essence. Of course, on the eternal positive, Plum Deluxe includes love and gratitude on the ingredient label. As I sat on the back porch, listening to rain pattering on my leaking deck roof, sipping my cup of Delightful Morning, I couldn’t help but get lost in the flavor (and the love and gratitude). The leaking deck roof forgotten, I reach for my kindle and snuggle down with my cup. All is right with the world for now. I think I’m going to sign up for the Plum Deluxe Tea Club, too. Each month, you receive a seasonal tea blended just for the club. Additionally, you get free shipping on all of your orders – and a free surprise sample. They also sell gift sets and tea accessories. I think I’m ready for a little more love, gratitude, and positivi-tea (I did it again!). Why does this southern girl prefer hot tea?